It seems that Ontario’s Southwest is replete with far more than agriculture and renewable energy. Sure, it can be easy to assume that the part of the province roughly wedged between Lake Huron and Lake Erie that runs from west of the G.T.A. to Windsor and Point Pelee is rather focused on what the land provided to it does best. However my family and I recently discovered when looking for a final summer getaway that there is more to southwest Ontario than one would assume. A quick reach-out to Ontario’s Southwest with a wish-list of eco-friendly tourism ideas, turned into the makings of a pretty memorable family getaway. The goal was to find options that were family-friendly, with an eco-friendly edge. The result were a pair of destinations that offered the promise of all we had hoped for. Our itinerary would start with a visit to Clovermead Apiaries and Adventure Farm, near Aylmer, ON where an educational experience about bees is combined with an agricultural adventure farm full of great activities for the young and young at heart. Also included was an overnight at Long Point Eco Adventures - a unique ‘glamping’ experience where all 15 accommodation units or ‘Wilderness Suites’ are actually pimped-out tents that come with beds more comfy than at most 4 star hotels, hardwood floors, electricity, Wi-Fi, a full washroom and a chance to shower under the stars. While at Long Point Eco Adventures we also booked an observatory experience at night plus zip lining with myself and my 3 sons the following morning. While our observatory experience was muted by the overcast skies, they did open up enough to get a unique glimpse at Saturn and it’s rings. 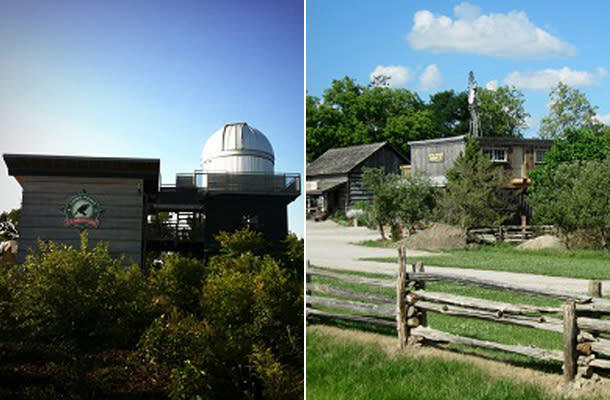 We were told that the observatory is located in one of the darkest spots in S.W. Ontario so the chance to see stars and galaxies is usually quite good. To make the eco-tourism theme more complete, our chariot of choice was a 2014 Nissan Pathfinder Hybrid. The Pathfinder Hybrid is one of only a very select few of 3 row, 7 passenger hybrid vehicles and offers drivers the fuel efficiency roughly of a mid-sized sedan but in a much larger package. 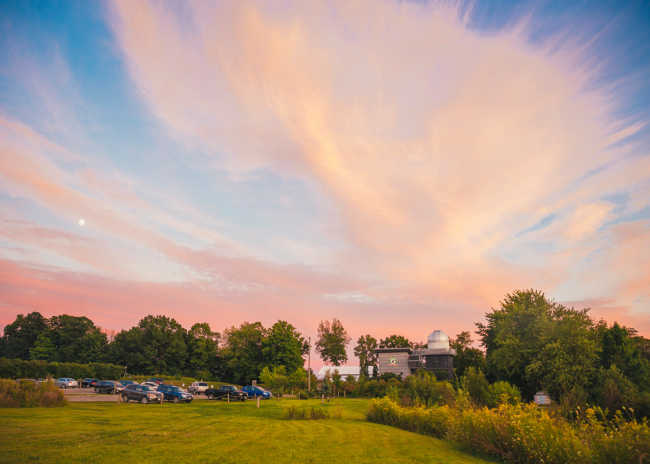 While it might be easy to overlook Ontario’s Southwest when it comes to family getaways and instead look towards the more traditional getaway destinations of the north and east, we quickly discovered that doing so would ignore a host of great opportunities and ideas. Agriculture and wind farms may still be the engines of the landscape, but it seems that tourism and plenty of great destinations offer plenty of thrust on their own to keep the area vibrant and strong.